NOAH London on 30-31 October 2019 at Old Billingsgate is Europe’s top investment-centric networking conference where 1,500+ senior executives and investors spend most of their time in pre-arranged meetings. The main program is focused on company presentations from Europe’s most successful digital companies and investors – helping the next generation of leaders scale faster and learn from past mistakes. 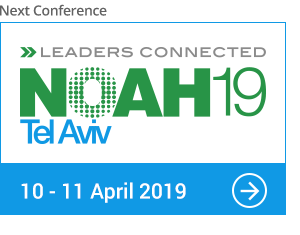 TravelPerk, the leading business travel booking and management platform, is the official travel partner for the Tel Aviv, Berlin and London NOAH Conferences in 2019. In the course of the next weeks, we will publish London exclusive travel packages for NOAH attendees, please stay tuned.